Located in the south of the city, a fast developing commercial district, guests at Kempinski Hotel Taiyuan will enjoy convenient access to the Taiyuan National High-Tech Development Zone, many office buildings and a multitude of leisure facilities. We would be delighted to personally meet you with our airport limousine service when you arrive at the Wusu International Airport. Please contact us prior to your arrival to arrange a pick-up time. 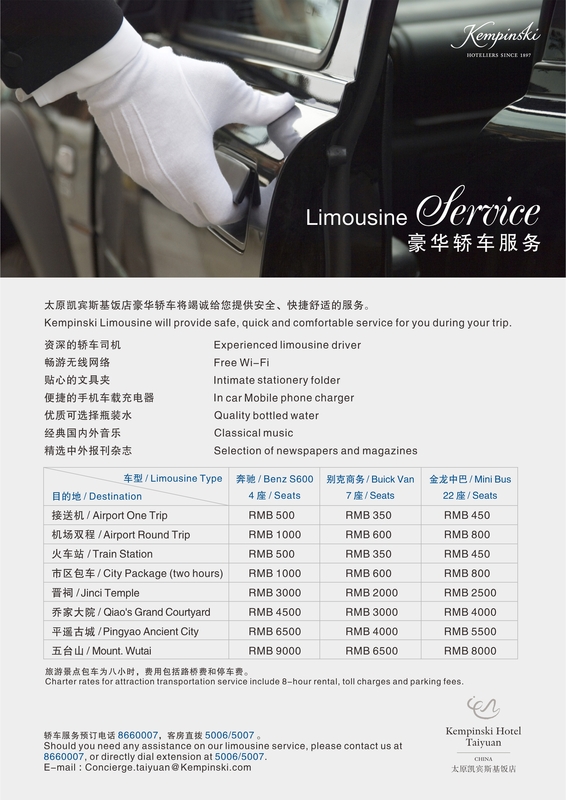 For further information, you can download the Limousine Service brochure. Directions by car: Take the Airport Expressway. At the end turn onto the Binhe East Road heading towards the north, and then turn onto the Changfeng Street heading towards the east, the hotel will be to your left hand side. The hotel is located 12km north-west of Taiyuan Wusu International Airport, 7km south-west of Taiyuan Railway Station and 8 km north-west of Taiyuan Bullet Train Station. The city's major shopping centres such as Tianmei Plaza, Fashion Walk, Parkson, Wangfujing are all within walking distance. The Shanxi International Expo Centre is only 3km away west side of the hotel. It is only 1.5 km away from the National High-Tech Industrial Development Zone of Taiyuan. Shanxi Sports Centre with the newly built stadium is only 10km away from the hotel.